Xiaomi launches Mi Band 2 fitness tracker with 0.4-inch OLED display and heart rate sensor. Today Xiaomi launched next-gen Mi Band 2 with OLED display which displays Time, Steps Count and Hear Rate at just $23 (RMB 149). The Mi Band 2 will be available for sale from 7th June, 2016 onwards in China and compatible with Android 4.4 or iOS 7.0 above devices. The Mi Band 2 comes with a 0.4-inch OLED display that shows Time, number of steps, Heart Rate, distance walked, calories burned, battery info and other data. Mi Band 2 equipped with a power efficient ADI accelerometer with improved algorithms for more accuracy in steps counting, and built in optical heart rate sensor which calculates your heart rate. It features a 2nd gen Bluetooth 4.0 for faster and stable connection with your phone and sports a larger 70 mAh battery. Mi Band 2 automatically monitors your physical activity and alerts you when you are sedentary for long time. It alerts you with a vibration reminding you to go out and have some physical activity. You can unlock your smartphone instantly with your Mi Band 2. Each Mi Band 2 has an unique ID and when it brought closer to the smartphone, it unlocks your phone. 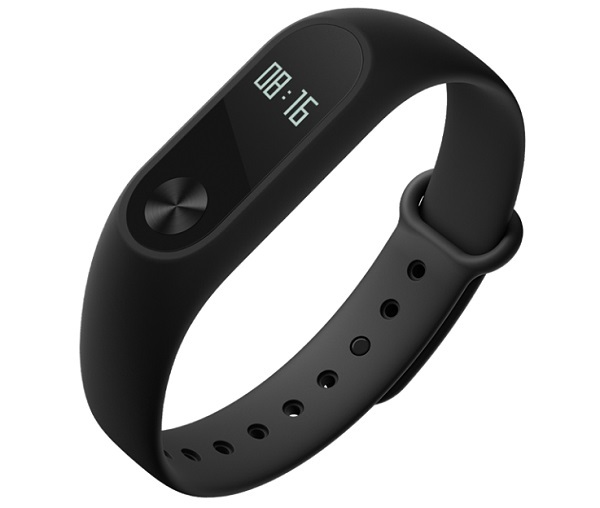 Mi Band 2 is IP67 certified water resistant and vibrates on getting any calls, SMS, app notifications and also vibrates when you set alarm clock.